Reports are a powerful way to view your data. You can customize your reports to best organize your data for your needs. You can also have them automatically emailed to you. We have also recently introduced a Advanced Reporting for maximum control over your reports. 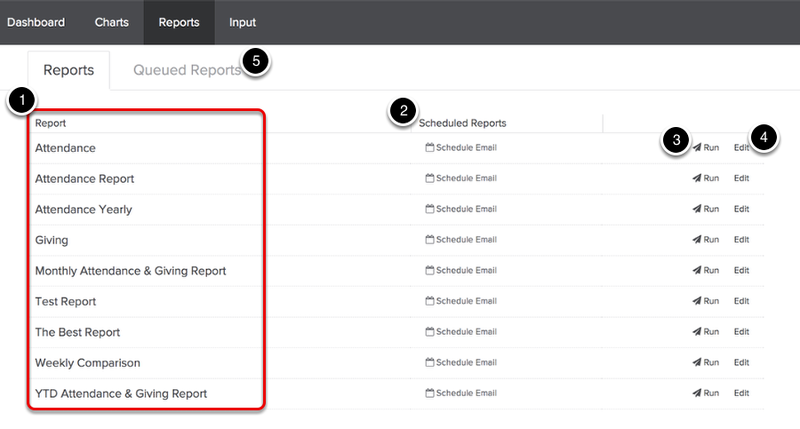 The Reports Tab is where you can schedule and run reports. Here you can see a list of all of the reports that have been created. If you would like to have your reports automatically emailed to you, you can have Church Metrics handle that for you. To view your reports, you will need to Run your report. Once you run your report, it will appear in your "Queued Reports" tab. "Queued Reports" shows a list of all of the reports that you have run. The "Queued Reports" tab is where you can see all the reports that have been run. Report Title is the name of the report that was run. Run Date tells you the date that the report was originally run. Status informs you of the progress of your report. "Completed" means that your report has finished and you can download it. "Running" means that the report is still running but will be ready shortly. Reports that cover a larger amount of data take longer to run. View PDF allows you to view the report on the page without having to download any files.